Wikileaks - We help you safely Get the Truth ! Note : The Article is Taken from "The Hacker News Magazine" - June Edition. Download Magazine here.. The United States Department of Justice has left no stone unturned in their ruthless attempts to uncover or fabricate evidence against Wikileaks founder Julian Assange. Their goal is to charge Assange with conspiracy to commit espionage. If the United States is successful Julian Assange will become the United States convenient scapegoat, along with others like US citizen and Army Pvt. Bradley Manning. These two will disproportionately take the blame for the United States failed policies and crimes. Julian Assange has said that the long and cruel detention and forthcoming US government prosecution of Army Pvt. Bradley Manning is nothing more than an attempt to "terrorize whistle-blowers" and that Pvt. Manning like himself is a victim of alleged government repression and mistreatment. "There is no doubt the U.S. government has tried to terrorize whistle-blowers into not revealing important information to the public," But Assange believes it has failed to have a chilling effect. Assange has stated that “Courage is contagious”. And that Wikileaks has seen a dramatic increase in the number of sources willing to come forward," he also stated "Fear no doubt is also restraining their activities ~but there is an increased supply of materials coming to us." He also said that the Manning's case and U.S. government threats to prosecute WikiLeaks have not slowed expansion of the organization. All that Julian Assange has done is to be the messenger of information. The information disseminated by Assange included diplomatic cables which revealed many United States failures and debacles beyond any doubt, along with prima facie war crimes and crimes against humanity and the revelation of the information has embarrassed the United States. Unfairly, Assange has already been labeled a “high tech terrorist” by the Vice President of the United States, Joe Biden, and Admiral Mike Mullen’s claims that Assange might now have “blood on his hands”. They both know better. It is a disgrace that many citizens of the United States and the world must be reminded that exposing corruption and crimes is not breaking the law, but up holding the law. To prosecute whistle blowers like Wikileaks Julian Assange is a serious threat to democracy and sets a dangerous trend. We must understand that a democracy must rely on a free press to inform its citizens and keep governments accountable to the people. In times past Julian Assange would have been hailed as a true patriot of democracy. So let’s look at the man behind our information revolution who is now both a respected and reviled figure around the world. Julian Paul Assange was born July 3, 1971 in Australia. 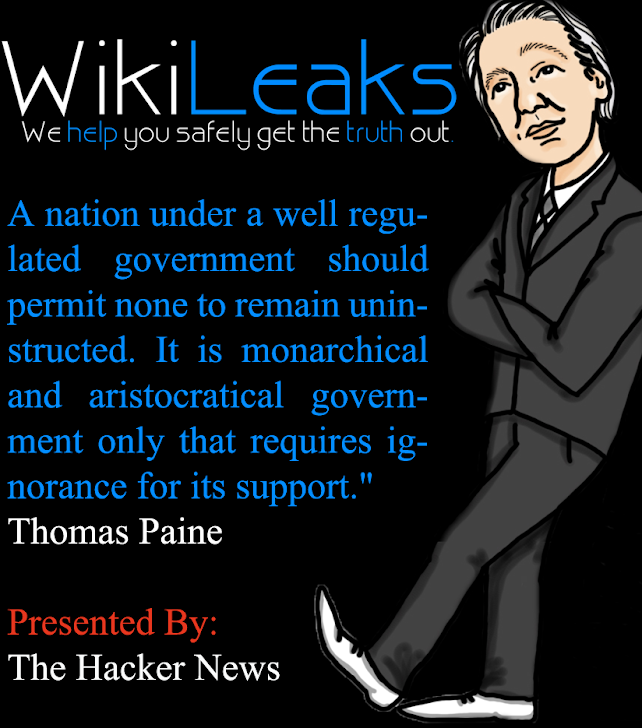 Today he is the editor in chief of WikiLeaks a whistleblower website with a stated purpose of creating open governments. WikiLeaks was founded in 2006. That year, Assange wrote two essays setting out the philosophy behind WikiLeaks: "To radically shift regime behavior we must think clearly and boldly for if we have learned anything, it is that regimes do not want to be changed. We must think beyond those who have gone before us and discover technological changes that embolden us with ways to act in which our forebears could not." In his blog he wrote, "the more secretive or unjust an organization is, the more leaks induce fear and paranoia in its leadership and planning coterie.... Since unjust systems, by their nature, induce opponents, and in many places barely have the upper hand, mass leaking leaves them exquisitely vulnerable to those who seek to replace them with more open forms of governance." Assange is a prominent media spokesman on WikiLeaks' behalf. While newspapers have described him as a "director" or "founder" of WikiLeaks, Assange has said, "I don't call myself a founder"; he does describe himself as the editor in chief of WikiLeaks, and has stated that he has the final decision in the process of vetting documents submitted to the site. Assange says that WikiLeaks has released more classified documents than the rest of the world press combined: "That's not something I say as a way of saying how successful we are – rather, that shows you the parlous state of the rest of the media. How is it that a team of five people has managed to release to the public more suppressed information, at that level, than the rest of the world press combined? It's disgraceful." He advocates a "transparent" and "scientific" approach to journalism, saying that "you can't publish a paper on physics without the full experimental data and results; that should be the standard in journalism." In 2006, CounterPunch called him "Australia's most infamous former computer hacker." The Age has called him "one of the most intriguing people in the world" and "internet's freedom fighter." Assange has called himself "extremely cynical". He has been described as being largely self-taught and widely read on science and mathematics, and as thriving on intellectual battle. WikiLeaks has been involved in the publication of material documenting extrajudicial killings in Kenya, a report of toxic waste dumping on the coast of Côte d'Ivoire, Church of Scientology manuals, Guantanamo Bay procedures, the 12 July 2007 Baghdad airstrike video, and material involving large banks such as Kaupthing and Julius Baer among other documents. I strongly believe Wikileaks and the work Julian Assange has done is about freedom and justice. Julian Assange is a brave defender of justice and freedom. He is a modern day Paul Revere willing to risk his life to inform the world of crimes and injustice. We are often cheated by powerful industries, corporations and governments who care more about profit than about people. Wikileaks, headed by Julian Assange has shown a bright light on the darkness of great power and their hidden shocking secrets. His website Wikileaks, founded in 2006, has so far selectively released around 12,000 of more than 250,000 secret documents in has in its possession. All things considered, Julian Assange maybe correct when he gives credit to WikiLeaks and it’s work with triggering a "year of miracles for journalism" that has enhanced the transparency of the U.S. and foreign governments and contributed to the democratic revolutions sweeping across the Arab world.